Click here to download the exhibition brochure, which contains an interview with Lahav and a detailed view of the artist’s process as he moves from an idea to a finished portrait. The Great Americans has been made possible with the generous support of the Connecticut Department of Economic and Community Development, Connecticut Humanities, The Hartford Steam Boiler Inspection and Insurance Company, and Bouvier Insurance. Additional support has been generously provided by a group of Exhibition Fund donors, as well as donors to the Museum’s Annual Fund. Who are our national heroes? Benjamin Franklin? Rosa Parks? Albert Einstein? Lahav’s nearly seven-foot-tall paintings of 30+ famous figures are a celebration of America layered with references to history, lore, and imagery that shape our understanding of these larger-than-life icons. Through his psychologically complex and cheeky treatment of iconic figures from politicians to celebrities, Lahav explores the nature of cultural identity. Organized by the artist and the Museum’s Curator Amy Kurtz Lansing, The Great Americans explore the ideas of who we consider “great” and the cultural underpinnings of our perceptions (whether fact or fiction). 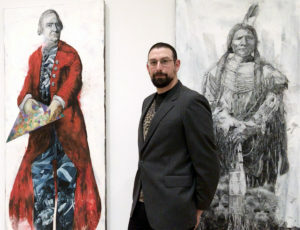 Lahav created several new works for his series to reflect the evolving canon of American heroes. Jack Lahav, Oprah Winfrey—Cut of Cobalt Cloth, 2018. Oil on canvas, 80 x 32 inches, courtesy of the artist. Jack Lahav, Ruth Bader Ginsburg—Justice, 2018. Oil on canvas, 80 x 32 inches, courtesy of the artist.